A few news stories from Britain caught my eye this week. The first involves a father who has been driving behind his child who walks to school in order to try to keep him safe. Another story I spotted was a story about a rise in driving lessons for children aged 11 and up. A spokesperson from one of the companies involved, Kim Stanton, from Young Driver, said: "We are teaching youngsters the vital skills they are going to need in later life to drive. 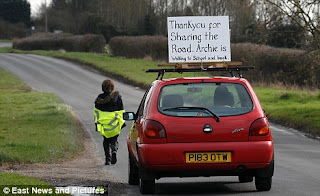 A primary school in Cambridge has decided to support a campaign to stop a road (which they're not even on) being transformed to be better for cycling, "due to concerns about where parents will leave their cars when they drop off and collect their children." The photo shows what the very same school looked like when we took our children there, by foot, five years ago. Neither the police nor the school authorities appeared to have any interest in the problems caused by such parking, and it can only have got worse in the last five years with such car centric attitudes. There are more photos. The short sighted stupidity of this is quite incredible. I mentioned a few days ago that cycling and walking rates by children were plummeting in the UK while the rate of children driven to school has risen. Is it any surprise that this is happening when even schools are amongst those working against children walking and cycling to school ? A few weeks ago, I blogged about how schools here are implementing stopping bans specifically to avoid this sort of situation from ever occurring. It's perhaps not surprising that Britain's children, amongst the least independently mobile in Europe, should also be the least happy. The father who drove behind his child later wrote a very good letter "Why do drivers have more rights than the rest" about this experience. Peter Miller also wrote about it. This excellent bridge is one of many small bridges which provide cyclists in Assen with a more direct route than they would have by travelling by car. As you can see, it's the usual width for cycle facilities here, giving 4 metres width for bicycles and an additional 2 metres for pedestrians. This bridge is a small facility in itself, and it's what has been done with the residential roads which link with it which I find really special. While there are quite a lot of resident's cars parked along these streets, there are very few moving cars. These streets only provide through routes for cyclists, not for drivers. You would only travel by car along these streets for access to properties on them. The one way system exists in order to give cyclists greater permeability through the city. It makes cyclists journeys shorter and more convenient, and bridges such as the one shown help to make sure that only cyclists and pedestrians can benefit from these shorter routes. There is no "rat running" in a location like this because driving here leads to longer and slower journeys by car. These roads do of course all have 30 km/h speed limits. Due to the almost total lack of motor vehicles, the effect is of a segregated cycling experience without any actual separate cycle paths. The map shows how it is useful. 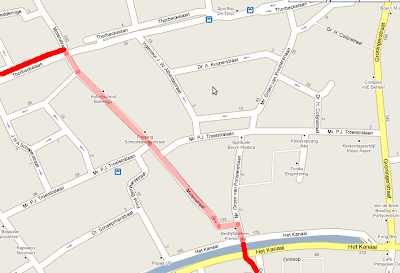 My marks in red show a cycle path which is part of my route in the top left corner and the bridge at the bottom. The pinkish line shows part of my route that day on these residential roads. You'll see that virtually every one of these small roads is one-way to motor vehicles. Every single one has an exception for bicycles. While there very many roads which are one-way for motor vehicles in this city, I have yet to find a single one which has the same restriction on cyclists. This shows a fundamental difference in the thinking behind one way systems in the Netherlands vs. that in the UK. I can't claim to have seen every Dutch one-way system, but I've seen a few now. And they don't have the same emphasis that I've seen in Britain. This is a race-track for cars. While it's right in the middle of the city, this is an A road - the busiest classification of road in the UK except for motorways. There are several sets of traffic lights, the speed limit is 30 mph / 50 km/h and high levels of acceleration are the norm. There are always at least two lanes heading in any one direction, and as many as four at the North Eastern corner. It was difficult to ride around this on a bicycle at a sufficient speed not to feel in danger when changing to whichever lane you might need for whichever direction you were heading in. Lately there was an addition of a way to cycle on the pavement through the middle of this mess in a North-South direction, which I found quite relaxing after years of negotiating the roads. However, it is far from perfect. It manages to increase an 80 m straight line route to about 110 m in length, and it includes no fewer than 3 traffic light controlled crossings (+ one zebra which pedestrians have priority at, but not cyclists) and a couple of rather too tight bends into this short distance. What's more, the part of the pavement marked for cyclists to use varies between 1.5 and a maximum of about 2 metres in width even though it's for bidirectional use. This is very far from adequate. The emphasis here is on maximising car parking space at the expense of pedestrians. Cars are encouraged to park half on the already narrow sidewalk, leaving little space for pedestrians. Such streets have to be one-way for drivers as clearly there isn't room for cars to travel in both directions. However, they are also generally one-way for cyclists - meaning that cycle journeys to these houses are longer than they should be. In any case, travelling in the opposite direction on a bike leads to conflict with oncoming drivers. It is again an example of a one-way system which is designed to convenience drivers, and while this particular street has a 20 mph speed limit, drivers frequently exceed it. On such a road it is no longer possible for pedestrians to comfortably walk on the sidewalk. People pushing babies in prams often have to walk in the road due to the obstruction of the sidewalk. In the UK, permission has only just been granted for "except cyclists" signs to be tried out on one-way streets (follow the link and read the comments beneath to get a flavour of the usual anti-cycling vitriol which accompanies any such small step forwards). However, while road design remains biased towards motoring, this change will not be as useful as it should be. The crossing shown in the first photo never makes cyclists or pedestrians wait more than 8 seconds. If I cycle this way into the city centre, this maximum 8 second delay is the only traffic light that I meet. We were visited this weekend by our friends Jim and Sally McGurn and their son Joseph. The McGurns run the York, UK based cycling promotion company Get Cycling and previously have been involved in many cycling ventures in the country such as the excellent Bike Culture Quarterly magazine and the Encycleopedia. They combined visiting us with picking up some new bikes to add to their fleet, including the Conference Bike shown in the video, and got to try out some of our bikes while they were here. Is cycling getting safer in Britain ? Recent reports have pointed out that there is a welcome downward trend in cyclist deaths in the UK. The numbers come from Office of National Statistics report. However, some reporters have gone further, and claimed that this is evidence of a "safety in numbers" effect, in that fewer injuries are occurring because the number of cycle journeys made in the UK is growing. Unfortunately, that conclusion is without any evidence to support it. For as long as I can remember, cycling organisations in the UK have made regular claims that cycling is booming. It may be more palatable news than reporting a decline, but actually there has been a downward trend since the 1950s, and cycling currently bumps along at probably the lowest figure it can reach. Currently about 1.6% of journeys in the UK are by bike - about the number you get anywhere where cycling is under stress. It will never be 0% because there are always bicycle fanatics1 who will cycle whatever the conditions, and always a few people for whom cycling is the only viable option due to its low cost. So what is 1.6% ? Well, as you see above, the average British person makes 16 journeys per year by bike. That's as many as the average resident of Groningen makes in 11 days. Of course these journeys are not spread evenly through the population. The fanatics cycle much more than that, and to make up for it, 70 % of the British population doesn't cycle at all. Not even once per year. 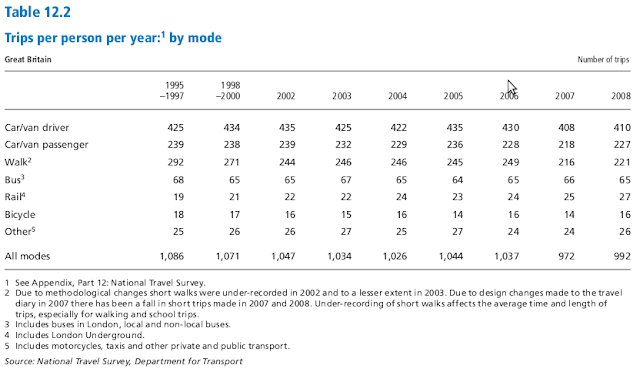 Note that the article referred to above, and the ONS document, both claim there has been a "17% increase on the previous year" in cycle journeys based merely on looking at the numbers for 2007 and 2008. However, the number of cycle journeys per year are reported as being between 14 and 16 for every year between 2002 and the present. This is just statistical noise, not a trend. 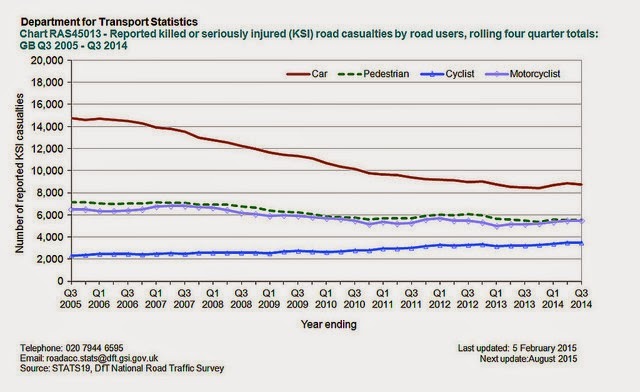 I suspect that there are two reasons for the apparent improvement in safety of cyclists in the UK. 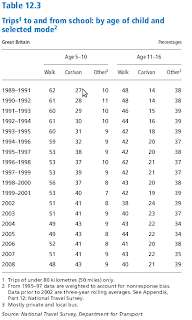 One reason is that the demographics have become yet more narrow, leaving just the fanatics, who tend to be experienced, cycling. Fewer British children are cycling, and children have never been the safest of road users (indeed, the UK's record on road safety for children is one of the worst in Europe). Perhaps this second set of numbers from the same document better explains the increased apparent safety of cyclists in the UK. While no figures are given for children cycling to school (it's been very low for many years, and the document notes that "Other" generally means a local bus), fewer children than ever now walk to school. Indeed, the most common way for primary school children to get to school in the UK now is by car. Reading the document you find such passages as "The majority of children aged 7 to 10 were usually accompanied to school by an adult in 2008 (86 per cent), an increase from 78 per cent in 2002." and that the main reason for accompanying children was "traffic danger (58 per cent)." It seems reasonable to assume that a similar change has occurred in child cycling. Others have noted that teenage girls hardly cycle at all in the UK. 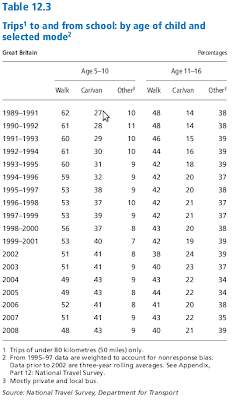 Other groups who feel less than confident on Britain's subjectively unsafe roads are also less likely to cycle now than in the past, or in countries such as the Netherlands where children have a remarkable degree of independence through cycling and virtually everyone cycles. Context. How are cyclists doing relative to other road users ? We must also put the improvement in safety for Britain's cyclists in the context of an overall improvement in road safety in the UK. 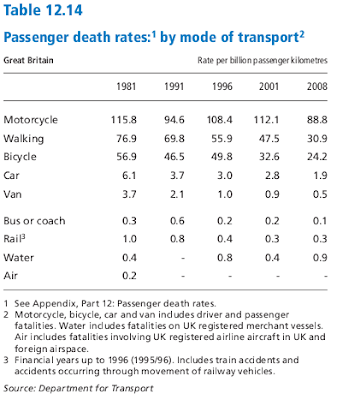 Britain's roads have become safer for all modes of transport, and actually cycling's improvement is smaller as a proportion (roughly 40% of the risk there used to be) than most other modes (driving now has 30% of the risk it used to have). We touched on school travel above, and I think it's interesting to compare the high profile that Britain has achieved internationally based on claims to have achieved changes in school travel ("The UK is a world-leader in terms of School Travel Plan (STP) development and implementation") with the reality of how walking to school has declined in the country. The comparison with the Dutch situation is stark. Words from government aren't enough. What is needed is the infrastructure which makes people feel safe when walking or cycling, which makes it an attractive and convenient thing to do. Streets in these two countries look completely different and that's why people's behaviour is different. I've pointed out before that Britain's overall record on road safety may be good, but it's not been achieved in the same way as the Dutch have achieved their even better record. You can read more on the effect of British policy on children. True improvements in cycling safety in the UK will result from building a proper network for cyclists, not through wishful thinking about safety in numbers. The inevitable result of slightly more people cycling with the same dangerous conditions is a rise in cyclist injuries (the blue line). Courtesy of Sam Saunders and the UK Department for Transport. Britain's roads continue to get safer for motorists as road and car design improve the safety of those who use motor vehicles. We should not be surprised that the small rise in cycling in recent years has led to more cyclists being killed and injured because cycling infrastructure has not improved in the UK. This is as we should expect. There is no "safety in numbers" effect. It has never existed. Cycling is safest where the cycling infrastructure removes danger and safer cycling conditions lead to more cycling. 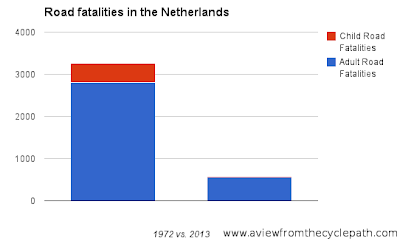 That is why the Netherlands still leads the world in cyclist safety. 1Don't be offended. I number myself amongst the fanatics. 40% of passengers on Dutch trains arrived at the railway station by bike. This makes it impractical to allow people to all take their bikes on the trains, especially at rush hour. In this way, cycling is a victim of its own success. One of the solutions to the problem is the OV-Fiets. The Dutch shared bike scheme, OV-Fiets, is a bit unlike most bike share schemes in that it operates with public transport. OV stands for "Openbaar Vervoer" which is Dutch for "Public Transport." These bikes are available at 200 locations around the country, including almost all railway stations. The idea is that they are used by commuters. An annual subscription costs just €9.50 per year, and then it costs €2.85 to hire a bike for a day. This can be a maximum of 20 hours - the idea being that it is not for tourists - though virtually every railway station also has normal hire bikes available. OV-Fiets bikes are always either under the roof of the railway station bike shop or in the possession of someone who has hired the bike. I suspect this keeps the vandalism rate well down in comparison with some other bike share schemes. However, they are also available from lockers or even "bike dispenser" vending machines at some locations. Anyway, the video shows the 400 OV-Fiets bikes which are currently in Vancouver in Canada for the use of Dutch athletes during the winter Olympics. It's a bit odd in that people are wearing fluorescent jackets, and even helmets... but the prime minister doesn't bother even though they're compulsory. On to the Olympics. 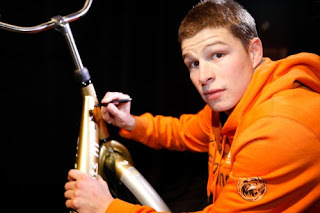 The photo shows Sven Kremer signing a golden OV-Fiets after winning the gold medal for the 5000 m ice skating race yesterday. He set a new Olympic record time of 6:14.60. I previously covered the amusing advertising for OV-Fiets. The video is another from Mark Wagenbuur. There are also vending machines just for innertubes rather than a whole bike. "This must never happen again" - how did 1.2 million deaths a year become normal ? According to the World Health Organisation, the coroner who looked into the world's first car crash fatality, back in 1896, said "This must never happen again". Unfortunately, it did happen again and it's kept happening ever since. These days, there are 1.2 million people killed every year by car crashes and another 50 million injured. If road deaths continue to grow at the expected rate, it is estimated that we will have seen growth of more than 60% between 2000 and 2020, meaning that nearly 2 million people per year will lose their lives in car crashes by that time. "Most of these injuries will occur in developing countries where more and more people are using motorized transport. In these countries, cyclists, motorcyclists, users of public transport, and pedestrians are especially vulnerable to road traffic injuries." In total, motor vehicles have killed more people in the last hundred years than wars have (I mentioned this in a previous post, but it bears repeating). Yes, motor vehicles have been far more lethal than such things as nuclear weapons, machine guns and napalm. In fact, you can add up all of the damage done by those things, and all the results of all terrorism right across the world, and still come up short of the death toll due to motor vehicles. Why do we put up with this ? I have a theory. I've noticed that while the lethality of motor vehicles might seem obvious given the results, people are often very surprised when cars crash and the results are serious. Cars feel safe and they are marketed as being safe but the danger that they present is beyond what people realise. If we fall when walking, the magnitude of the injury is quite close to what people expect. Normally you'll do no harm at all or perhaps get a minor injury such as a sprained ankle or scraped knee. You can go faster if you run, but you get worn out quickly. Cycling is a little more unpredictable. We've used a machine to make ourselves faster, but it still takes considerable human effort to raise our speeds much (there's a calculator here which shows how much effort for different speeds). Higher speeds are possible only after you've cycled enough to build the muscles, and experience comes at the same time. Falls hurt much more if you're going faster. If we fall while descending a hill the crash can be particularly dangerous. However, at least when you cycle you know it's going to hurt if you fall off. Personally, I like riding fast, but I'm a timid descender of hills because when going down hills some of my control is taken away. Cars give another considerable increase in speed, and there is a further difference. You can go fast for no real effort and with no practice or skill required. What's more, cars remove the cues that normally make us realize we're travelling fast, such as wind noise, and the feeling of wind in the hair and on the face. While even "slow" speeds by car are quite dangerous (especially for people outside the car), driving feels safe. It's so sanitised an experience that it's actually boring enough for people to fall asleep while driving at speeds which would keep you very much awake on a bicycle. This is why crashes are such a surprise. People often simply don't know what happened when they crashed a car. People stop concentrating on what they see as mundane tasks and that's why no amount of legislation will make drivers safe. Somewhere in middle of the confusion comes the blame shifting. If you walk into someone in the street you would not blame the other person. If you cycle into someone you also probably wouldn't. However, driving somehow changes this. The victims frequently get the blame. There is a simple way to solve this problem of vulnerable people being hurt and that is to remove the cause of danger from where the vulnerable people are. Where cyclists are concerned, cycle-paths are the most obvious way of achieving this. It is also possible to remove danger by unravelling driving routes away from cycling routes and to otherwise segregate modes without building specific cycling infrastructure. Places for people who don't drive, such as schools, should not be designed around cars. City centres should be accessible without the threat of danger. When conflict and risk are designed out of roads by following the principles of sustainable safety, the injury rates drop. The result of separating motorists from cyclists and pedestrians: Between 1972 and 2013, fatalities on Dutch roads dropped dramatically. Child fatalities reduced to just 2% of their former level. It's not a problem for society if those who are looking for a thrill in a car do so on closed circuits but it is if they do it on the public roads. Many people claim that they like cars and like driving but very few take up motor sport so they can truly test their skills. In reality the purported love of driving often comes down to nothing more than people driving cars to get to places because it is the least bad option open to them. 1.2 million deaths per year are tragic enough, but they're actually just the tip of the ice-berg. There are also 50 million people injured each year by cars. What's more, the deaths due to crashes are not all of the deaths. It is difficult to pin down exactly, but some estimates put deaths due to pollution from cars at ten times the figures for crashes and deaths due to effects such as obesity due to a sedentary lifestyle assisted by the car are also a major cause of death. The image at the top left comes from the December 1929 issue of Popular Mechanics magazine. Exactly the same policies, of shifting blame onto pedestrians for being hit by cars, exist all around the world, including in current safety campaigns in the UK. This map shows the locations of existing and proposed "fietssnelwegen" in the Netherlands. These are long distance cycle paths which have priority at junctions and which are provided to make long distance commutes practical. They are somewhat greater in scope than what are referred to as "cycling superhighways" in other places. These are often publicised as a part of the "fietsfilevrij" campaign which emphasises that a long bicycle commute means avoiding traffic jams on the roads. Cycling policy in the Netherlands has gone a lot further than just providing routes within cities. Many people also make regular longer journeys. Up in the top right corner there's a vertical green line between A and G. This represents my 30 km long commuting route between Assen and Groningen. I assume that the line is still green as the work is not finished on the route, however it is still very very good. I pointed out before that I find this route to be a lot more efficient than the roads in the UK ever were. We rode a part of the 50 km long Amsterdam to Utrecht fietssnelweg as part of the Oliebollentocht a few weeks back. You can see just that section of the video which shows the fietssnelweg by clicking here. Long distance cycle journeys are more popular in the Netherlands than other countries due to conditions which encourage cyclists and make those journeys ever easier. 34% of all journeys up to 7.5 km are by bicycle in the Netherlands, 15% of those between 7.5 km and 15 km and 2% of those over 15 km in length. 2% isn't a huge proportion, but it's a larger one than bicycles are used for even for the shortest of journeys in many countries. If people are put off cycling, even temporarily, they may not return. For this reason, much effort is expended to make sure that cyclists are not endangered or inconvenienced by road works in the Netherlands. This film by Mark Wagenbuur shows two different examples of temporary bridges being built to maintain cycle routes in 's-Hertogenbosch. See the labels below for more bridges, more from Den Bosch, more from Mark and more coverage of what happens to cyclists when there are road works. Much is sometimes made of the requirement for cities to have a high population density in order to encourage cycling. It is said that it is essential for populations to live in densely packed areas to keep journey distances short before people will take to cycling. Looking at the behaviour of the Dutch, who cycle more than the people of any other country, this seems to be a flawed suggestion. Or at least an over-simplification. It is true that the population density of the Netherlands as a whole is quite high. There are nearly 400 people per square km in this country. Much higher than the 32 per square km that you find in the USA. However, whole country size scales don't really have much to do with the journeys that most people make on a daily basis. Let's try this with densities of provinces or states, and cities within them. Assen is the capital of the province of Drenthe. This province has the lowest population density in the country, with 183 people per square kilometre. The capital of Drenthe is Assen, which has an area of 83 square km and 784 people per square km. Five US states are denser in population than Drenthe. New Jersey, Rhode Island, Massachusetts, Connecticut and Maryland all have higher densities, New Jersey's population density is higher than that of the Netherlands as a whole. Delaware has the closest density to Drenthe, at 170 per square km. The capital of Delaware is a small city called Dover home of just 35000 people spread across 58 square km - which makes 617 people per square km. These figures are really not so different to those for Assen. Assen's population makes 41% of all journeys by bike. Does anyone know the cycling rate of Dover ? Would it be reasonable to assume it's somewhat lower than Assen ? Or look at the bigger cities. Los Angeles has over 3000 people per square km, but just 0.9% of commutes are by bike. New York has over 10000 people per square km. That's more than twice the population density of Amsterdam, but while 38% of all journeys in Amsterdam are by bike, only 0.6% of commutes are by bike in New York (which amazingly is still enough to be in sixth place amongst large American cities). The same is also true of Devon in Delaware. Take a look at high school parking in Delaware and compare it with high school parking in Assen. Would it be conceivable for an American school to hold a triathlon as my daughter's school did here in Assen, telling the students to ride their bikes unaccompanied to a swimming pool at a sports centre 20 km away ? It's quite mind-boggling just how little Americans cycle. However, it's also quite obvious why. Infrastructure has been designed over decades in such a way that it excludes cyclists. The photo was taken in the 1950s in Los Angeles. Does where you live look like an inviting place to cycle ? Driving is the norm in many places because the infrastructure is designed around the car and it makes driving appear to be the only reasonable option. You see cars and car centric infrastructure almost anywhere that you randomly drop the Google Street View man in the USA. Whereas you've a good chance of getting cycling infrastructure and cyclists in street view scenes in the Netherlands. It's perhaps interesting to note that the highest cycling rates in much of the Netherlands are actually in the North of the country, in the least densely populated areas, where journey lengths are often a bit longer. It's not population density which really makes the difference in cycling rates, but infrastructure which makes cycling into an obvious option. It has to be the most convenient, pleasant and safe way to get about. That's why 93% of the Dutch population ride a bike at least once a week. There are many other excuses for why populations of other countries don't cycle. I featured that photo at the top before. It's what Los Angeles already looked like in the 1950s. Roads like this are a large part of why people would choose not to cycle.